Minot Club meet with Rainbow for Girls at their Mini Grand in Fargo on Saturday, March 19, 2016. This weekend the guys in Minot came to Fargo to help the Rainbow Girls with Mini Grand. We got to help the El Zagal Shrine units and the Rainbow Girls with a spaghetti feed. To end the night we played numerous games with the girls, some better than others. But overall this weekend was great; I hope we will be able to do it again soon. Thank you very much to Club Dad David (Doug) for putting up with us all weekend. And a huge thank you to Ross for providing the meal for Minot and Hazen guys to celebrate DeMolay Day with us at Space Aliens. It was a great way to celebrate the day! 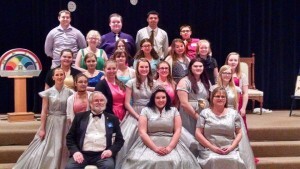 North Dakota DeMolay, © 2019 North Dakota DeMolay.